Review: Rurouni Kenshin: Seisouhen, often translated as Rurouni Kenshin: Reflection, is a fitting translation given what the anime encompasses. The first episode highlights moments in which the life of Kenshin Himura, a wandering ronin, intertwines with that of Kaoru Kamiya’s, a woman who runs a dojo, while the specter of Tomoe, a woman he loved, hangs overhead. The second episode sees Kenshin as an older man who has settled down but is still grappling with the sins he’s committed and chooses to atone for it by wandering once more. We see Kenji, Kenshin’s son, struggling to escape his father’s shadow as well as his resentment towards his father’s many absences. But above all, we see Kaoru bravely shouldering a part of Kenshin’s burdens, knowing that it will ultimately kill her. Amidst this backdrop of melancholia, anger, tragedy, and impassioned persistence, Taku Iwasaki succeeds in distilling the essence of those emotions. The opening track is beautifully contemplative. “On the Pier” strikes at the heart as it expresses a yearning for the return of a loved one. In its presentation, we hear the flute longingly call out, along with a stirring of warmth from the strings and oboe that reveals an eager heart, fortified by wonderful shared memories that brim up to the surface for all to see. If “On the Pier” captures all the passions that roil about in the anime, “An Old Patriot” opens the door into Kenshin Himura’s past. Its moody introduction, heard through the solitary piano and the sinister backdrop, evokes Kenshin’s storied early years as an assassin during Japan’s turbulent Bakamatsu period. When the cellos come in, the atmosphere takes a heavy turn and the strings carry the somber air on, sprinkling a dash of hope that is all too ephemeral. By the time the oboe takes over, the piece will have moved on to convey the suffering that Kenshin endures in solitude, all through a motif that will become familiar by the time this album is over. This feeling is heightened in “Regret,” where the woodwinds meander aimlessly, as though in an emotional haze, while the piece on the whole throws us upon the edge of despair. It’s not until “Indigo” that urgency and intensity begin to seep in. Its piano ostinato is outstanding in the way it raises our adrenaline, giving a foundation that the violins build upon to set the tone for the action to follow. “Revenge of the Ghost” takes that idea further, starting with a discordant introduction that drips with danger and dread. This suffocating feeling makes way for an intense battle theme that, while grim, is exciting in the way it lets the fury flow unimpeded. As the piece dies down, the oboe’s wails become cathartic as the anger dissipates, leaving only sadness left in its wake. But when it comes to action, “The Duel (in the name of love)” remains one of the best action pieces Iwasaki has ever composed. A lone French horn sounds out the theme to “On the Pier” providing this piece with a lofty air that rises magnificently. Then, the magnificence sidles off and the percussion takes over, stomping with abandon as the strings fire off their vicious melody. Throughout the percussive intensity, the piece captivates with its dynamism; we hear the tension growing thick with an anger and hatred begging to wreak vengeance upon a foe. Later on, the cello growls, signaling an impending doom that moves slowly and deliberately, until a closeted memory stays the killing blow. What follows is a melancholy oboe melody that brings the piece to a gentle close, providing a cathartic end to the battle and leaving us gratified. As the battles come to a close, life goes on, but there’s a restlessness which remains. “You By My Side” is a thoughtful track that delivers a quiet, but emotionally heavy atmosphere to reflect the emotional turmoil that Kenshin undergoes as he struggles to come to terms with his past misdeeds. And yet, Iwasaki still makes room for a supportive romance to blossom poignantly. A few tracks after, “Heart of Sunrise” moves away from the melancholia with its stirring optimism. The piece’s progression conveys the eagerness and excitement related to the title event through the strings, which rush towards an epic finish. The middle section channels urgency, but once the trumpet makes its serene entrance, there’s a slow, triumphant close, indicating that the weight of guilt is lifted, and that the warrior who fought so hard for so long can finally be at peace. 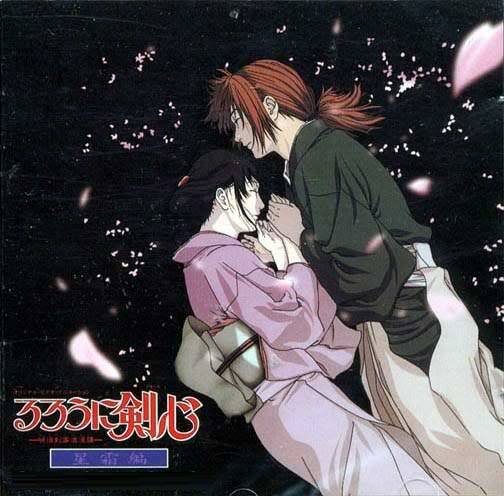 And so, Iwasaki closes out the Rurouni Kenshin: Seisouhen soundtrack quietly. First, we have “Cord of Life,” which ties the music thematically through an introspective rendition of “On the Pier.” The calm ending then emerges through “Pie Jesu,” where the piano provides a wonderful introduction before the orchestra swells with delight. The feelings that bubble forth are enthralling as the ups and downs of Kenshin Himura’s life conclude in the warmth of a loved one’s arms, allowing two hearts, previously separated, to unite forevermore and leaving us satisfied with Iwasaki’s poignancy. Iwasaki has always had such a gift for melody. I love his strings writing and there’s a lot of that on this soundtrack. I don’t consider this his masterpiece, or my favorite of his, but it’s certainly very good. His earlier works are undoubtedly some of his strongest. I don’t like what he’s become nowadays but I’m glad he still throws a bone every now and then like those strings pieces on Crowds or the opera piece on JoJo. It just shows he’s still as much of a genius now as he was back when he wrote this music. P.S. Congrats on six years. My co-writer and I have come to the flippant conclusion that he’s too cool to do more classically-oriented fare on a consistent basis. I think you characterized it best as him throwing us a bone every once in awhile to keep us happy. Out of curiosity, which one tops it for you? My question to you is how well do you think this compares to Trust and Betrayal? Never appricated this score as much as I should’ve due to the overall badness of this OVA distracting me from it, so I’m glad you decided to give it attention. For the short version, what really stands out the most in Trust and Betrayal is in how well Iwasaki sculpts the atmosphere for the show through his music. So that album shines the most when it comes to the ambience as we see the tragedy play itself out. The Seisouhen OST edges it just a bit by being more melodically enjoyable and a touch more consistent. Both are very solid albums and represent Iwasaki at his best, but if I’d have to choose which one to listen more on a standalone, it’d be this one. And yes, it is a shame Seisouhen was a “meh” overall story, so I can see why people haven’t been bothered to check out the soundtrack. Such a beautiful anime/movie, and the music is great. Just found your blog through Beneath the Tangles. Never knew anyone had a blog on anime music! So glad to have found your work, keep it up! Will be exploring around here God bless ya.